INSTEAD OF BRINGING STUDENTS TO THEIR PROPERTIES, HAVEN CAMPUS COMMUNITIES IS BRINGING THEIR PROPERTIES TO STUDENTS. Last year, Haven Campus Communities rolled up to Kennesaw State University in Georgia in a large, colorful truck, playing music, blasting bubbles through the roof, and handing out T-shirts and pizza. The truck showed up at tailgates for football games, threw pop-up parties at local hangouts, and just had some fun with the students. Needless to say, the company, and its truck, garnered some attention. Jay Williams, president of Atlanta-based Haven, says his firm’s mobile marketing truck was all about connecting with students, getting into their inner circles, and creating brand awareness centered on a fun lifestyle. “As a student housing brand, I feel we have an opportunity to connect with students in multiple ways that they identify with and like,” Williams says. Marketing research has shown that the growing presence of food trucks is really resonating with people, especially younger generations, with lunch just outside their dorm or on the walkway between classes. Williams saw food trucks as a way to bring his product to where students already are instead of trying to draw them away to a specific location. With the mobile marketing truck, Williams’ sales team at Stadium Village, the community Haven Campus Communities built at Kennesaw State, could go out to events, get students excited, and then hand out fliers. 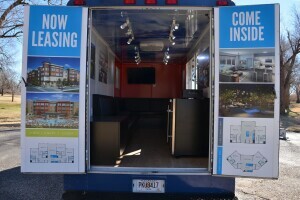 The leasing agents could also invite students inside the truck, where there are couches, a fridge, and flat-screen TVs that show renderings and floor plans of the community. It creates a balance where the truck is really just there for brand awareness but can draw people in further if the sales team senses their interest. “The great thing about having the mobile marketing truck is we can literally just show up anywhere and all we need to have is designated people on our staff to be prepared to show up at these different events,” says Williams. The sales team does both scheduled and spontaneous events. It will mark a calendar of football games or spring flings where they know students will be out roaming campus. However, the team also relies on their student employees to tell them when something is coming up so the team can hop in the truck and go. Williams says the results have been great so far. Stadium Village, where Haven piloted the program, was pre-leased three months early. This past fall, Haven rolled out two more trucks: one to promote 18 Nineteen Apartments at Texas Tech University and another to showcase Haven South at Baylor University. Both are projects are scheduled to open this August. Having the trucks out promoting the new buildings before they’re even ready has given the company’s properties an edge over the competition, according to Williams. “Because of what it is, it’s fun, and it leads people to talk about it, which leads to leases,” says Williams.